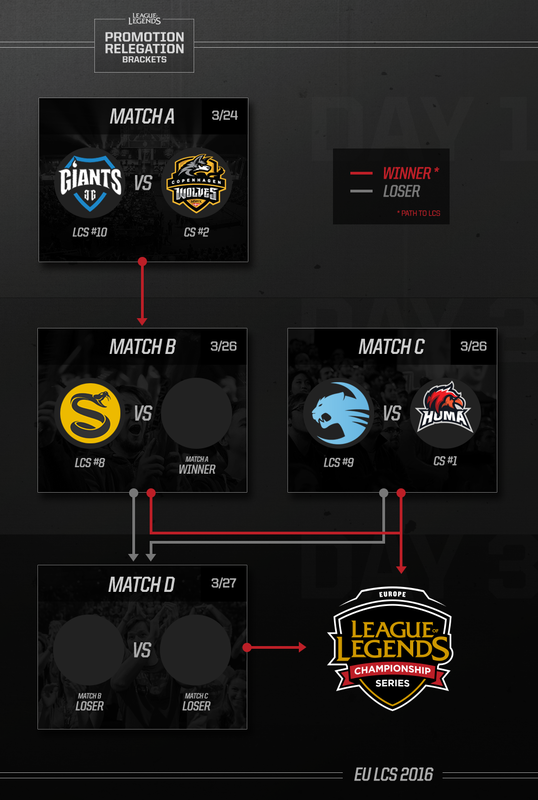 Between March 24th and March 27th, tune in for the EU LCS Promotion Tournament and see which three of the five competing teams will earn a spot in the EU LCS Summer Split! Continue reading for schedules, standings, and VODs once they become available! March 24th, 26th, and 27th will play host to the EU promotion tournament! 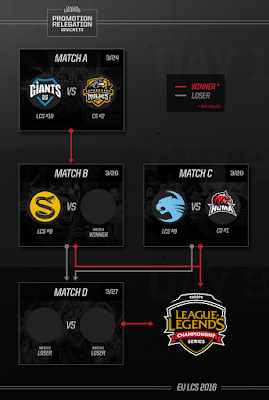 The bottom three EU LCS Spring Split teams and the top two EU Challenger Series teams will face off to see which THREE teams will compete in the 2016 EU LCS Summer Split! Each of the four matches in the EU promotion tournament will be best of five. The EU Promotion tournament will be played on 6.5! Be sure to tune in April 6th - 8th for the NA LCS Promotion Tournament!